Stereo bonds can represent the 3D representation of a molecule in 2D: on the canvas. Create them in Marvin JS: You can find these kind of bonds in the Bonds combo-box on the Tools toolbar. Just click on the desired bond, and it will appear on the tip of the cursor. Now, you can put it anywhere on the canvas as many times as you want. Usage in Marvin JS: You can edit these bonds, as the others. See in details here. Both optical isomerism and geometric isomers can be determined in Marvin JS. Create them in Marvin JS: In order to assign the R or S label to a chiral center and the E or Z label to a double bond, the Calculate stereo button of the General toolbar should be used. The R/S and E/Z labels are determined via WebService, the Marvin JS WebService uses the Cahn-Ingold-Prelog priority rules (CIP convention). If a carbon atom has four different substituents (or three different substituents and an implicit hydrogen) and at least one of them connects to the chiral carbon with a wedge bond, the R or S label can be calculated. 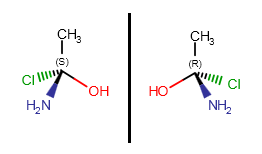 Absolute configuration of a chiral center can be marked by R or S stereo labels. When both double bonded carbon atoms have two different substituents, the stereo labels are calculated by determining the priority of the four substituents using the CIP convention. If the higher ranked substituents are on the same side of the double, the molecule is the Z isomer, while the E isomer has the higher ranked groups on opposite sides of the double bond. The "Absolute" chiral flag on a molecule indicates that every chiral center marked with wedge bonds has a known absolute configuration, in other words the structure represents a single, well-defined stereoisomer. Create them in Marvin JS: The chiral flag can be added to a molecule through the Empty space or the Selection pop-up menu. Display: The visibility of the chiral flag can be turned on/off in the View Settings dialog window. In MDL file types (MOL, SDF, ...): wedge bonds describe the relative configuration of chiral centers; the structure is a racemic mixture of two enantiomers. In Daylight file types (SMILES, SMARTS): wedge bonds describe the absolute configuration of chiral centers; the structure represents a single enantiomer. Marvin JS supports the MDL enhanced stereo representation. Enhanced stereo specifications refer to several stereoisomers of a molecule by drawing only one structure. Adding these notations to chiral centers makes it possible to represent stereochemical information: whether we know the absolute configuration of a stereogenic center or we have information only about the relative configuration of two or more chiral atoms. Each group label consists of an identifier, and – in some cases – of a number. Each and every stereocenter belongs to only one stereogenic group. The following table contains the available identifiers. We only know the configuration of the atom relative to another chiral center, but we do not have information about the absolute configuration. We use the „And" notation if we want to represent a mixture of stereoisomers which can contain specified enantiomers/diastereomers or even every optical isomer. Set and modify these properties in Marvin JS: You can add these properties to the chiral atoms via Atom properties dialog. You can find a more detailed description of enhanced stereo representation along with a set of examples in the JChem Query Guide.